Our Bodacious Dog Mom Life: Our New Cuisinart Electric Meat Grinder Will Be Delivered On Thursday! 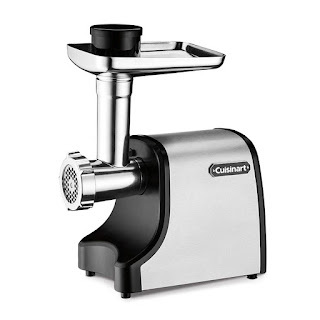 Our New Cuisinart Electric Meat Grinder Will Be Delivered On Thursday! A couple of days ago, I mentioned that I was going to shop around for a meat grinder. This is a kitchen appliance I never thought in a million years that we'd want or need. Over the past couple of days, I've shopped around for one. I've scoped the great big virtual world for sales, online coupons, reviews, and researched what we need versus what's out there. After looking at various retail sites and models, I tinkered with the idea of purchasing the meat grinder attachment for our KitchenAid. However, the bulk of the reviews were awful. At least a dozen people mentioned that it didn't function properly and the piece either cracked or left ground metal in the meat. Although a handful of people gave the attachment a decent review, we weren't going to take any chances. The original price was $184.99. It was on sale for $99.99. I had a coupon for an extra 15% off. Then, I stacked another coupon for $10 off $50. After using the online coupons and tax, the total cost was $81.35. And, we received $10 in Kohl's Cash. Lisa and I gave each other a high five. Our meat grinder will be here on Thursday. The kids are very excited because they love my homemade meatball dog treats. And, they're looking forward to the other homemade dog treat creations using the meat grinder. We are happy Dog Moms.